That's great! But a new one on me. I do wonder if that Fritz box is accurately reporting the interleaving status, as what has happened ties in with what is normally expected from an interleaved (downstream) line and with the history of your line. Thinks - up comes a dim memory of some modem/router or other that does report the upstream value of interleaving in both fields. I say this because the expected minimum downstream interleaving depth on G.INP is 4, with the most frequent value being 8. It never completely removes it, and I've never seen anyone report it being activated direct from Fast Path. Note that a few people rightly corrected me on my answer to your second question. Nobody on my answer to your first . Yes, I am also on Zen via FTTP. The problem you outline is exactly what I had but the latest firmware 1.0.9.34 has fixed it and has been stable since I installed it several weeks ago. Do you think you could get the stats from the box using telnet please? Take a look at this post to see what I mean. What that posts shows is the raw stats obtained by DSLStats, but I normally use telnet in a command line prompt. I think you will fine that there is the small amount of downstream interleaving I mentioned. You also see all the stats in one go, which is far more useful than words like Off, On and Many. Which Connection Type did you select. I was also on firmware v1.0.9.34 and tried Auto Select/Config, PPPOE, DHCP and 6to4 tunnel. Unfortunately, could not get any to work. 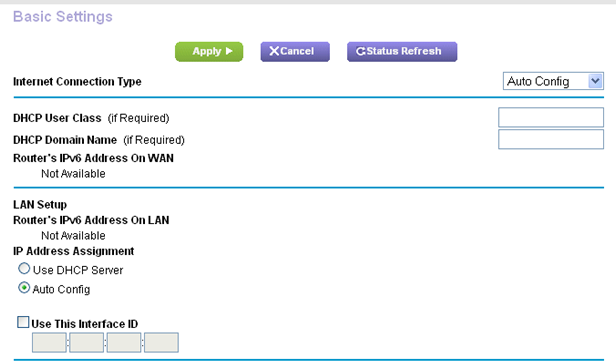 But if the Netgear R7000 does now work correctly with IPv6 on Zen that is good to know. FRITZ!Box via Telnet is not supported. Also the DSLStats app does not appear to list any Fritz boxes. Sorry. I'm definitely having a bad day and should shut up . Once again I misread a post - the one I linked to, and thought those stats had come from his 3490. But they are from his TG589. Googling telnet for your 3490 suggests it isn't possible. LAN setup I use Auto Config. I have a second R7000 as a spare and that works fine too.